CRIMINAL MISCHIEF – On September 01, 2015, Officer Gina Bruno was dispatched to a residence on the 900 block of Leeward Ave., for a criminal mischief report. The resident reported that a vehicle parked in the driveway was observed to have red spray paint on the passenger side of the vehicle. The incident is being followed up by Detective Adam Greisemer. FIRE CALL – On September 02, 2015 at 4:20pm, Sgt. Derek Mussari and Patrolman David Bowden were dispatched to a residence on the 400 block of Spar Avenue for a possible gas leak. The Beachwood Fire Department arrived and determined the gas leak was related to an issue with the oven. CRIMINAL MISCHIEF – On September 02, 2015 at 8:52 pm, Patrolman David Bowden was dispatched a residence on the 900 block of Leeward Avenue for a second report of damage to a vehicle. The resident reported that their 2 door Acura had the front emblem removed and a side view mirror damaged sometime during the overnight hours. Detective Adam Griesemer was assigned to follow up. MOTOR VEHICLE BURGLARY – On September 03, 2015 at 8:15 am, Lt. Glen DeMarco responded to a residence on the 1200 block of Windward Avenue for vehicle that was entered sometime between 4:00pm on September 02 and 8:00am on September 03. The resident stated that the vehicle was left unlocked and that nothing appeared to be missing but that items were rummaged through. CRIMINAL MISCHIEF – On Septemeber 03, 2015 at 9:25am, Officer Randy Cabrera located a street sign that was damaged on the corner of Lookout Street and Beacon Avenue. The sign post was damaged as if it may have been hit by a vehicle and the sign was knocked off the post. The sign was recovered and turned over to the Public works Department to be repaired. BURGLARY – On September 05, 2015 at 1:05pm, Patrolman Justin Apel was dispatched to a vacant business on the 700 block of Atlantic City Boulevard for a report of subjects in the building. Upon the arrival of the officers two 16 year old male juveniles were observed in the building. 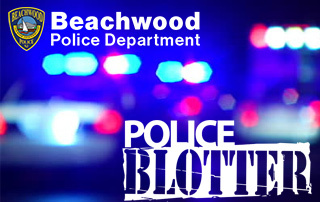 The juveniles were arrested and transported to Beachwood Police Headquarters where they were processed and released to a parent. Juvenile complaints were signed for burglary and possession of marijuana. Patrolman Phil Schena assisted at the scene. FIRE CALL – On September 05, 2105 at 3:34pm, Patrolman Apel was dispatched to a residence on Walnut Street for an oven fire. Upon the officers arrival the fire was contained to the oven and had burnt itself out. The Beachwood Fire Department responded and checked the residence and found it to be safe for the residents to return. FIRE CALL – On September 05, 2015 at 11:20pm, Officer Gina Bruno and Sgt. Derek Mussari were dispatched to the intersection of Atlantic City Boulevard and Beachwood Boulevard for a small brush fire. The Beachwood Fire Department responded and extinguished the fire which was contained to a small grassy area. CRIMINAL MISCHIEF – On September 08, 2015 at 3:03pm, Patrolman Phil Schena responded to a residence on the 300 block of Beach Avenue for a report of a tire damaged. The resident reported that between 1:35pm and 2:30pm they noticed their vehicle tire was flat. Upon trying to put air in it a puncture hole was located in the tire. THEFT – On September 11, 2015 at 7:06am, Patrolman Dennis Allen was dispatched to a residence on the 1100 block of Spar Avenue for a theft report. The resident reported that they noticed items missing from their garage area which was open after seeing several kids playing in the area. The items taken were vapor liquid for an electronic cigarette and a small bank with change in it. FIRE CALL – On September 15, 2015 at 5:43am, Patrolman Thomas Prince and Patrolman Allen Magory were dispatched to a residence on the 300 block of Forepeak Avenue for a fire alarm activation. Upon their arrival, along with the Beachwood Fire Company, the alarm was determined to be a faulty CO2 detector alarm.